Who hasn’t experienced FOMO? Fear of Missing Out is a real thing, thanks to the social world we live in. Don’t succumb to FOMO. Rather, grab life by the horns and visit Virginia’s Blue Ridge to knock out these spots worth a share on your Instagram feed. Consider bringing a friend to share in the journey. How more iconic can any outdoor excursion be than putting one foot in front of the other on the Appalachian Trail? Though it runs 2,190 miles from Georgia to Maine, the majority of those miles meander along the Blue Ridge Mountains of Virginia (554 miles, to be exact). Our top picks for capturing incredible Instagram photos on the Appalachian Trail are Dragon’s Tooth, McAfee Knob, and Tinker Cliffs. Dragon’s Tooth and McAfee Knob are adjacent points of interest off of Route 311 in Catawba. Dragon’s Tooth is to the west and McAfee Knob is to the east. Tinker Cliffs can be accessed from Route 220 & Catawba Road via the Andy Layne Trail on Tinker Mountain. Together, these three are known as the Triple Crown. The Crown can be conquered in individual trips or in one 32-mile multi-day loop. Virginia’s Blue Ridge is a bustling beacon for beer lovers in the mountains with many great breweries to choose from. 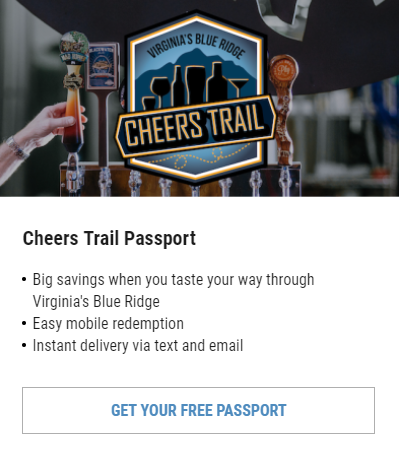 Virginia’s Blue Ridge Beerway is a self-guided tour of those breweries plus the new Deschutes Roanoke Tasting Room, while the chauffeured Roanoke Craft Beer Tour ushers you to three breweries with in-depth, behind-the-scenes action. For those who are looking for incredible scenery and equally incredible beer for a memorable Instagram shot, consider Ballast Point in Daleville, Parkway Brewing in Salem, and Chaos Mountain Brewing in Callaway. You won’t go wrong. Sipping wine at sunset is a favorite pastime in Virginia’s Blue Ridge, and we have plenty of wineries to choose from. Some of our favorites for FOMO-inducing Instagram shots are Valhalla Vineyards in Roanoke, Blue Ridge Vineyard in Eagle Rock, and Peaks of Otter Winery in Bedford. Say cheese! Whether it’s tailgating, the National Anthem, the first at-bat, or that amazing goal, sporting events are always awesome options for unforgettable ‘grams. Capture the vibe of Lane Stadium at a Virginia Tech football game, the sunset over the mountains at a Salem Red Sox baseball game, or the gritty expressions of perseverance at a Roanoke Rail Yard Dawgs hockey game. >> Check out our Sweepstakes and enter to win VIP tickets to a Virginia Tech football game! If you’ve never been on the Blue Ridge Parkway, why not? It’s long been called “America’s Favorite Drive,” and curiosity alone should lead you to take that scenic route. The overlooks are numerous and breathtaking, but we have a few key favorite places you should note and seek. Mabry Mill is perhaps the most photographed site on the entire 469-mile Blue Ridge Parkway. It’s certainly an icon in Virginia’s Blue Ridge. We love to visit at least once per season just to see the mill framed in a variety of colors. As a destination, the Peaks of Otter are three mountains along the Blue Ridge Parkway, Abbott Lake, and Peaks of Otter Lodge. Lunch and dinner are excellent at the Lodge with water views from the dining room. A brisk or leisurely walk around the lake offers many photographic opportunities. We’re confident you can score your highest “likes” to date with a shot from anywhere at this destination. Pine Tree Overlook at milepost 95.2 delivers a sweeping view from 2,490 feet and the aforementioned Peaks of Otter in the distance. Why not capture shots from the top of a peak or two and then shoot back at them from Pine Tree Overlook? Paddling the 45-mile Upper James River Water Trail or the 45-mile Roanoke River Blueway in any season is an awesome adventure, but in fall? Oh, that foliage. What a backdrop you’ll have when you kayak or canoe either of these scenic rivers. Speaking of “scenic rivers,” 59 miles of the Upper James River is designated as a Virginia Scenic River. Get on it. By land or water, Carvins Cove is one of our favorite hidden gems in Virginia’s Blue Ridge. The reservoir is an important water source and is great for paddling and fishing. Explore the coves on the Cove or hike and bike the 40+ miles of trails around it. At 12,700 acres, we’re sure you’re going to come out with so many excellent photos you won’t know which to share on Instagram. 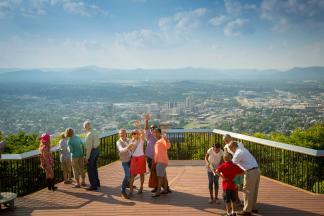 For one-stop family fun in Roanoke, head to Center in the Square. Shoot, it’s also great for solo travelers and couples! Take your time exploring the museums (Harrison Museum of African American Culture, Roanoke Pinball Museum, Mill Mountain Theatre, Science Museum of Western Virginia, and the new Kids Square Children&apos;s Museum), appreciating the view from the multi-level rooftop patio (don’t miss the butterfly garden! ), and the 6,000-gallon living coral reef aquarium, which happens to be the largest aquarium of its type in the Mid-Atlantic Region. A work of art in itself, no one would blame you for taking photos of the Taubman Museum of Art, nor climbing the stairs to capture photos from the roof. Nor capturing the sweeping glass panels of the façade – from the inside or out. Perhaps the best place to create a work of art is in or at a place that displays works of art. Roanoke’s most famous attraction is perched high on Mill Mountain, shining brightly through the night with the glow from 2,000 feet of neon tubing. 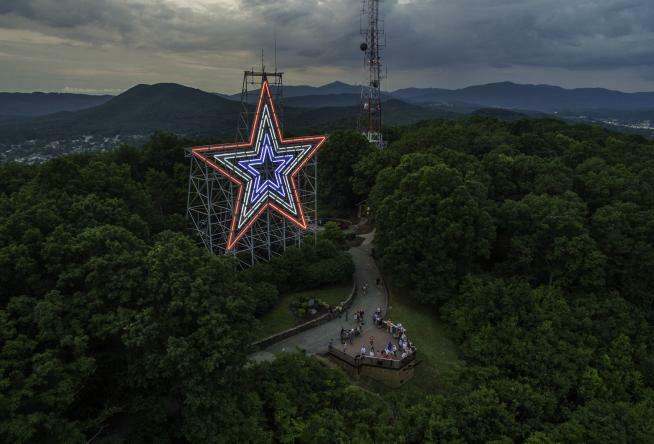 The incredible Roanoke Star is not just Virginia famous; it’s world famous. There is no other star like it anywhere in the world. Indeed, it’s one-of-a-kind and must be on any “world’s largest / biggest / brightest” bucket list. It’s about time you get on with your bad self, Ansel Adams. Go climb the peaks, sip the beverages, paddle the waterways, and create your own works of art in Virginia’s Blue Ridge. And when you’re done, hashtag it #BlueRidgeDay to spread the word.